I love the foods of Thanksgiving. Tons of warm and hearty flavors perfect for the cold and darkening days. 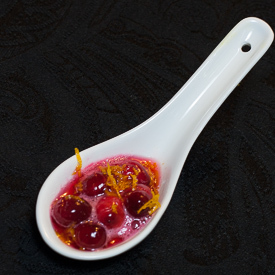 This year, I wanted to try a bit of a modernist take on Thanksgiving so I created this six course tasting menu full of fall flavors. Try out one of more of the recipes or create your own feast. 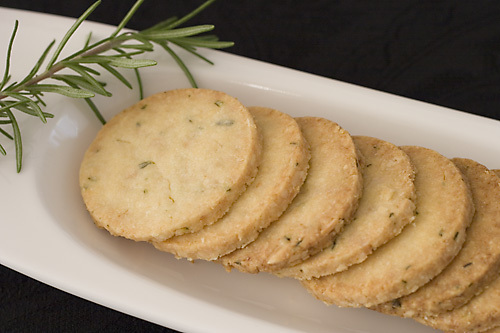 Savory cookies are quickly becoming my favorite appetizer. 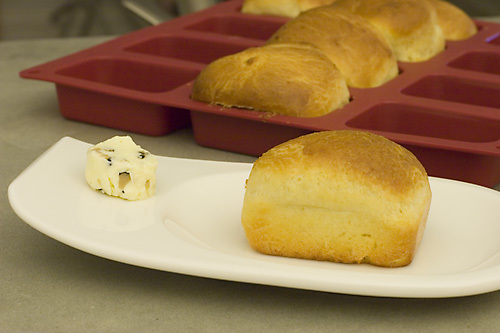 The dough lasts for weeks in the freezer so I typically make up a big batch and then thaw and bake the day I need them. 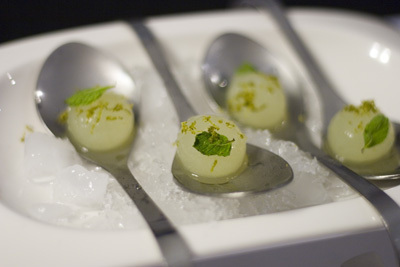 And the Mojito Spheres are a fun way to start off any evening. 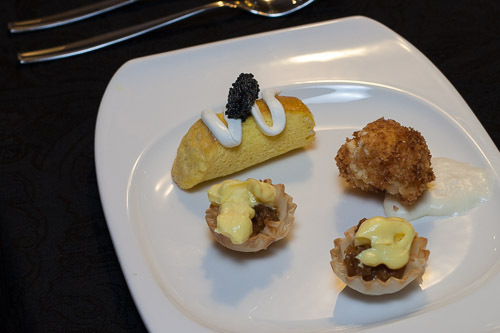 I paired the appetizer with a bottle of Michel Arnould Champagne – one of my favorite producers. Course 1: Caramelized Carrot Soup & Parmesan Breadsticks. With only four ingredients, this soup is deceptively simple. 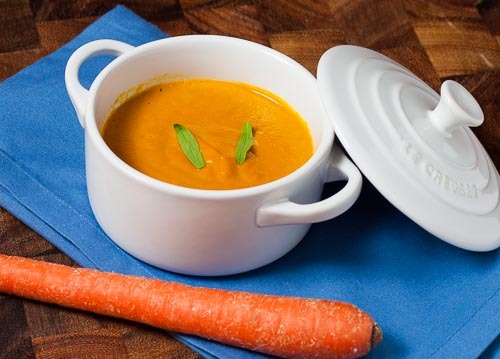 The real secret is in the pressure cooking of the carrots which gives them warm nutty caramel flavors that will make your guests questions whether they are eating dessert or a meal. 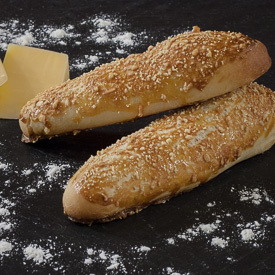 Both the soup and the parmesan breadsticks I served with it can be made ahead and frozen. I tend to make large batches of both to save time later. 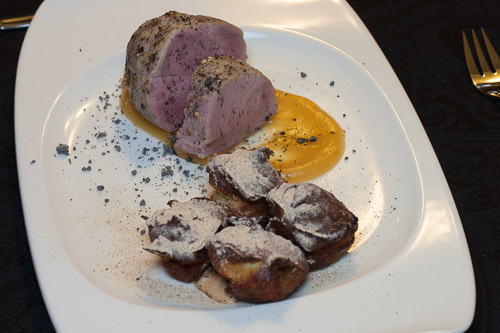 Because of the sweetness and richness of this dish, I chose to pair it with a 2009 Okonomierat Rebholz Riesling from the Pfalz region. I love eggs. They are one of the most versatile ingredients on the planet and are sometimes referred to as nature’s perfect protein because of their rich nutrient content. In this dish I put together three different preparations of eggs. One is a savory creme brûleé with flavors of parmesan and onion, another shows cooking egg yolks sous vide produces a perfect gel texture, and the third shows how egg yolks turn into a cake like substance when pressure cooked. To pair with all this richness, I chose a 2009 Jean Michel Guillon et Fils Satenay from Burgundy, France. Tired of boring dry Turkey? Sous vide is the perfect cooking method for turkey as it keeps in the flavor and prevents drying out. 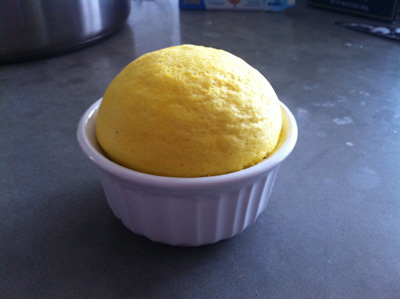 The velouté I paired it with is full of flavor which is perfect for sopping up with a light and fluffy brioche roll. I paired this dish with a 2010 Etude Pinot Noir from California. This dish for me represents fall on a plate. It’s full of great flavors like apples, chestnuts, and warm spices. 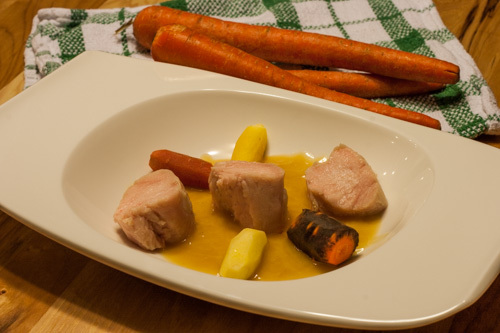 Again sous vide is the star here making the pork loin juicy, tender, and flavorful. I paired it with a 2007 Domenico Clerico Dolcetto from the Piedemonte region of Italy. 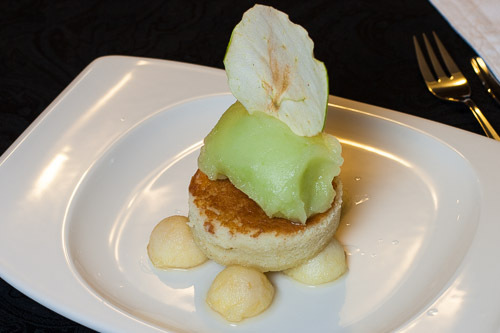 One of my favorite desserts – visually stunning and an interesting take on the versatility of apples. It starts with candied apple balls that are poached sous vide to prevent them from becoming mushy, then comes a soft apple cake, then a cool apple sorbet, and finally a crisp apple chip. I served this with a 2009 Faubel Beerenauslese from the Pfalz region of Germany. The perfect end to a perfect evening!